One Direction Release Alternate Kiss You Music Video! The 'Little Things' five-piece are seen messing around in brand new scenes for their recent hit single. 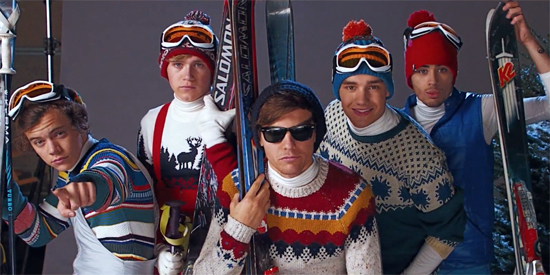 One Direction have unveiled an alternate music video for their single 'Kiss You'. The 'Live While We're Young' singers released their original music video earlier this year, as the third single from their album 'Take Me Home'. Harry, Zayn, Niall, Louis and Liam are back with a video that combines original footage from the 'Kiss You' video with exclusive behind the scenes shows of the boys filming the promo on set. The 'Little Things' stars are seen singing and messing around in costume and in front of green screens while shooting the video, which was released through MTV this week. The UK boy band have already had a successful month after picking up two awards, Favourite Music Group and Favourite Song, at the Nickelodeon Kids' Choice Awards 2013.